Former Gov. 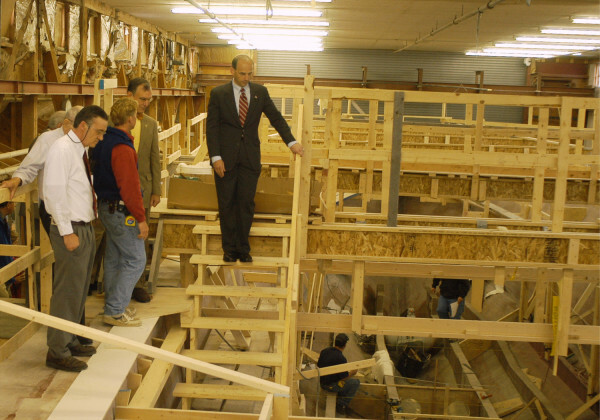 John Baldacci tours Lyman-Morse Boat Building Co. in Thomaston in 2006 to present the company's certification for Maine's Pine Tree Development Zone tax incentive program. The advocates who devised Question 1 on the Nov. 3 ballot could simply have written a law requiring the state spend $3 million annually on public campaign financing, collected the necessary signatures and put the initiative to a vote. Instead, they also proposed a funding mechanism that, if acted upon, more than covers the cost of the ballot initiative. It’s that funding mechanism that drew opposition Thursday from the Maine State Chamber of Commerce and 14 other business groups. “The business assistance programs this measure proposes to eliminate are critical to current and future investment in Maine,” Peter DelGreco, president and CEO of Maine & Company, which works to entice businesses to locate in Maine, said in a statement announcing the business groups’ opposition. “It would be a mistake to cut Maine’s programs at this time — these are investment-based programs that are modest, conservative and, most importantly, effective,” he said. But a simple reading of the ballot initiative’s text should assuage DelGreco’s concerns. The language that would become state law specifies that the tax incentives that would be slated for elimination are those found to be “low-performing, unaccountable tax expenditures with little or no demonstrated economic development benefit.” Indeed, the tax incentives Maine would eliminate are precisely those that aren’t worth it to Maine taxpayers. The business groups’ concern over the potential loss of $3 million annually in tax incentive programs would be valid if we knew for a fact, as DelGreco and Chamber President Dana Connors have asserted, that Maine’s slate of tax incentive programs are indeed effective in spurring economic growth. The problem is, we have no idea. For years, Maine policymakers have passed new incentives, credits, refunds and exemptions into law with good intentions — promises of redevelopment in economically depressed areas or of job creation in targeted industries, for example. Lawmakers have kept those programs — worth hundreds of millions of dollars in forgone revenue each year — in state budgets year after year. The state has never had a systematic way of judging their effectiveness, determining whether they’re actually meeting their intent, factoring into business investment decisions and resulting in increased job creation. As a result, policymakers can’t use high-quality information to guide their decisionmaking, whether it’s a decision to eliminate one program, start another based on best practices or rededicate the resources from one ineffective incentive to one that’s proving its value. “Any efforts to monitor or oversee these programs as an investment portfolio would be severely undermined by a lack of essential information,” OPEGA, the Legislature’s nonpartisan accountability arm, wrote in a 2006 report on 46 of Maine’s major economic development programs. But Maine is finally taking important steps to evaluate its incentive programs for their effectiveness. This year, lawmakers passed a bill — over the attempted veto of Gov. Paul LePage — setting up a rolling evaluation schedule for the state’s major incentive programs and charging OPEGA, armed with new staff, with undertaking the evaluations. Under Question 1, lawmakers are to use OPEGA’s determinations to guide their decisionmaking on programs to eliminate. There’s reason to suspect this funding mechanism might not work as intended. In 2013, a task force charged with designating $40 million in tax expenditures for elimination in order to balance the budget failed. At the time, though, it didn’t have the benefit of OPEGA’s evaluation. “If we can’t or fail to agree to a few million in cuts, we’re in pretty sad shape,” Sen. Roger Katz, R-Augusta, a Question 1 supporter, said. The tax expenditures slated for the closest scrutiny by OPEGA are worth, at a minimum, nearly $275 million annually in forgone revenue, according to estimates by Maine Revenue Services. It’s hard to believe that every dollar of that sum, absent scrutiny over the years, is being spent effectively. Once OPEGA’s evaluations offer more insight into the effectiveness of Maine’s incentive programs, it would simply be fiscally irresponsible for policymakers to keep underperforming programs on the books.